If you are looking to do dips, knee raises, push-ups as well as pull-ups in your own home, you're probably looking to purchase a power tower. A power tower is an excellent way to complete a full body workout that targets specific muscle groups including the triceps, chest, back, and arm muscles, all while helping you achieve high-quality form during the duration of the exercise. This form of body weight training can be an effective complement to more traditional bodybuilding activities, or it can actually replace it altogether. A power tower is a fairly unique piece of fitness equipment that efficiently enables you to perform a diverse series of movements- pushups, pull-ups, tricep-dips, and more. Can provide support for pull-ups, push-ups, tricep dips, sit-ups, and more. 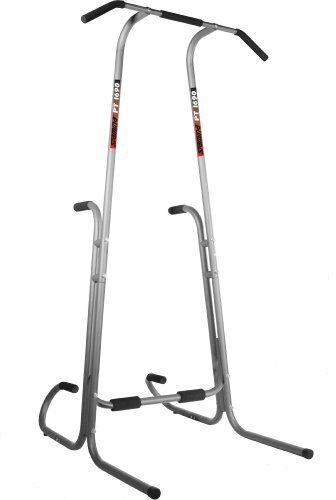 Stamina Power Tower measures: 50 x 81.5 x 41.5 inches (W x H x D) and it weighs 54 lbs. 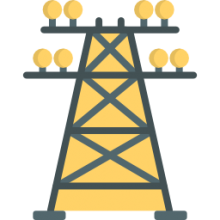 Let's take a look at some of the best power towers available for online purchase. This power workout tower promises to add definition to your forearms and biceps. It is well-constructed with solid steel-tubing and is fitted with padded hand grips and vinyl cushioned armed rests. This workout tower includes a push-up, multiple-grip pull up, and vertical knee raise station. Once assembled the dimensions are 57 (L) x 41 (W) x 84 (H) inches. It is safe for people weighing up to 300 pounds. However, assembling this equipment can be a bit difficult- make sure to follow the instructions to ensure trouble-free assembly. This is another popular choice. Its combination of features, positive user feedback and relatively low price make this our top recommendation. It comes with multiple exercise stations that support pull-ups, push-ups, sit-ups and tricep dips, among others. With its freestanding, compact design and dimensions of 50 (W) x 81.5 (H) x 41.5 (D) inches, it has a small footprint- making it a relatively snug fit for your workout area. For support and stability, it is made with tough steel frame that is easier to assemble than the other power towers we’ve looked at. However, its maximum weight capacity is a little less than average at 250 pounds. 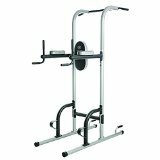 This multi-station workout tower is another power tower that has received solid acclaim from its users. It is particularly good for performing lower and upper body workouts. With its multiple grip positions, it is ideal for doing chin-ups and pull-ups. Moreover, it also has a leg raise and dip stations and comes with slip-resistant adjustable foot grips that double as push-up bars. Its paddings and arm cushions are high-quality. When assembled, it has an overall dimension of 57.5 (L) x 42.5 (W) x 84.63 (H) inches. While it is sturdy, some users feel that it is a bit flimsy when used for doing dips. It’s important that the unit is used on a hard, flat surface to ensure complete stability. The Gold’s Gym Power Tower promises to boost your overall wellness without going to the gym. This tower includes a vertical knee raise station, push up station, multiple-grip pull up station and dip station all in one for a total body workout. For added comfort and security while performing any exercise, it is fitted with padded hand grips, sturdy support base, and back and arm supports. The overall dimension of this fitness device is 57 (L) x 41 (W) x 84 (H) inches. When you buy this item, it comes with manufacturer’s warranty. Customer feedback is especially solid, though some users have had difficulty assembling it. This is another solid total-body fitness solution. With a maximum weight capacity of 275 pounds, this equipment is helpful in toning your upper and lower body. Among its features are two thick forearm cushions, wrist and elbow supports, rotating handles, extended leg stabilizers, and step support for the main frame. Made from durable reinforced steel, you can safely use this home fitness tower for doing push-ups, pull-ups, dips, chin-ups and leg raise. While it is easy to use, assembling this product can be a bit difficult. What are the benefits of a power tower? A power tower enables you to do chin-ups as well as hanging leg raises that are exceptional for developing abdominal muscles. This fitness equipment doesn't have a large footprint, so if you live in a small apartment it is a great way to get a complete workout. 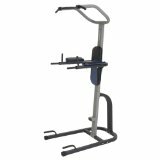 It combines the functionality of a dip station and a pull-up station into one device. Bodyweight exercises are proven to burn more calories than simply weightlifting on its own. This is because it involves more muscle movements and greater expenditure of energy to complete. Our handy comparison table outlines what we consider the best power towers on the market today. Besides examining that information, there are some other considerations you should keep in mind prior to purchasing this piece of fitness equipment. Make sure that you understand the dimensions of the power tower and that you are confident it will fit in the space you have designated for it in your apartment or home. Assembly can be a bit tricky- but most users were able to figure it out as long as they used the included assembly instructions to guide them. In general, the price range for a power tower is around the $100-$200 range. In our experience, it's better not to skimp, since a couple extra bucks will get you a higher-quality piece of equipment-you obviously intend to use it for a long time and hope to get the best experience out of it. Make sure you check out the warranty information prior to purchase. You want to be assured that you can return your device if it doesn't satisfy you.